Perail (pronounced Pe-rha-ee) is my cheese obsession of the moment. I first tried it at a vendor show, then began researching it’s origin and local availability. This palm sized disc of sheep’s milk cheese is imported to the United States from Aveyron, France. It has an edible, bloomy white exterior with a mild, lactic-cream-like flavored interior paste. At room temperature the texture is quite oozy, but with a self contained rind it’s a great option for picnics and brief traveling excursions. Dalmatia is the company behind the introduction of fig spread to the greater American public. 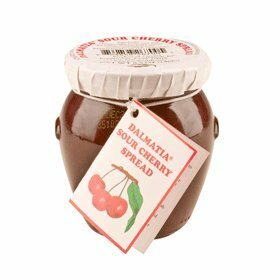 Now they are opening the vault to bring us Sour Cherry Spread – my next new favorite kitchen item. Serve this jam alongside Perail in a tasteful dollop, or smother the cheese as you would with baked brie. Serve at room temperature with fresh crusty bread such as a classic baguette. Being a “foodie with a life” means you have to enjoy the fruits of others labor. This nosh can be breakfast, an afternoon snack or even dessert. Another option is to make this into a pannini: Slice a ciabatta roll in half lengthwise, dress one side of the bread with Dalmatia Sour Cherry Spread, add thin slices of shallot, fresh arugula, Spanish Jamon Serrano and a smear of Perail to the other slice of bread. Grill on a panini press until bread is warmed through. Slice in half and serve immediately.